5000 years ago, at Kalapriya nagari on the banks of the river Yamuna, there resided a fishermen community and their chief was 'Dasha', who used their boats to ferry people across the river. 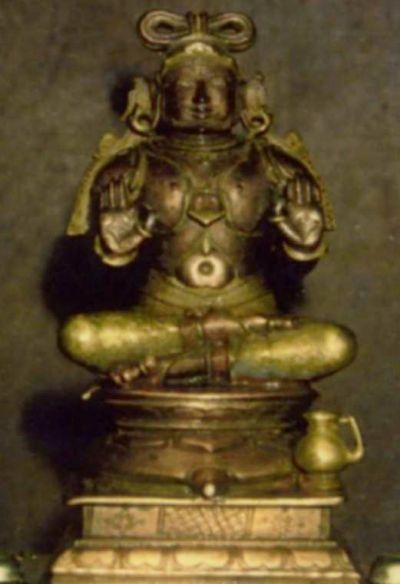 Satyavati Devi, was the foster daughter of fisherman Dasha . One day Sage Parashara, son of sage Sakti, and grandson of Sage Vashishta, on his way to his ashram at Parashana approached fisherman Dasha and asked to be ferried across the river Yamuna. As Dasha was having his dinner he asked his daughter Satyavati to take the Sage to the other side of the river. As guided by the Almighty, Parasara with a view to marry Satyavati, got down along with her on an island in the river. Just then Sage Vashishta, Yagnavalkya and other sages arrived there and duly conducted the rites associated with marriage. Sri Veda vyasa manifested as a divine child to Satyavati by a mere touch of Parasara. This was no ordinary birth. Lord Sri Vedavyasa, blue in complexion and born in lineage of Sage Vashishta, came to be known as Vashishta Krishna. Having been born on an island, He is also known as Krishna Dwaipayana. Brahma, Rudra and other gods in heaven rejoiced and celebrated the birth of Sri Vedavyasa, Jnana Avatar of Lord Vishnu. In Mahabharata Tatparya Nirnaya Sri Madhvacharya beautifully describes the first glimpse of divine Sri Vedavyasa. Bala Veda Vyasa forced himself into maturity. He instantly grew from a child into a mature young adult by his sheer will of power. Sage Parashara and Satyavathi performed the upanayanam for Veda Vyasa. For having performed the upanayanam, Sri Veda Vyasa blessed his father Parashara with knowledge about Sri Narayana. He had fixed his mind on ascetism. Before leaving, Sri Veda Vyasa gave a boon to his parents by promising to appear before them when they desired to see him. Sri Veda Vyasa's ashram is at Badri in the Himalayas and still inconspicuously lives in Badri Ashram beyond the eyes and reach of mortals. Sri Veda Vyasa divided and re-arranged the Vedas into four Vedas. He taught the four Vedas to his four disciples(Rig Veda to Sage Paila, Yajur Veda to Sage Jaimini, Sama Veda to Sage Vaisampayana, Atharva veda to Sage Sumantu) and entrusted them to teach it to the world. Sri Veda Vyasa composed the Brahma Sutras to render the correct import of the Vedas for the benefit of the competent souls. They are also called Vedanta Sutras, since they guide the enquiry about the true conclusion of all the Vedas. The Brahma Sutras are 564 and are divided into four chapters (adhyayas). 4. Phala – which gives the results of seeing him. Sri Veda Vyasa is the author of Puranas, the purpose of which is to take the essence of the Vedas to the common person. The eighteen main Puranas are as follows. There are eighteen Upa-Puranas which are as follows – Sanatkumara, Narasimha, Brihannaradiya, Sivarahasya, Durvasa, Kapila, Vamana, Bhargava, Varuna, Kalika, Samba, Nandi, Surya, Parasara, Vasishtha, Devi-Bhagavatha, Ganesa and Hamsa. Sri Veda Vyasa is also the author of Vishnu Sahasranama (thousand name of Vishnu) and the great epic Mahabharatha was narrated by Sri Veda Vyasa and scribed by Lord Ganesha.